The New Challengers: Super Edition contém 3 The New Challengers Booster Packs e 1 carta super rare promocional (de um total de 14 cartas). O produto apresenta alguns dos mais poderosos monstros pendulum já lançados, além de alguns dos mais populares monstros Xyz vistos na série animada Yu-Gi-Oh! Zexal. 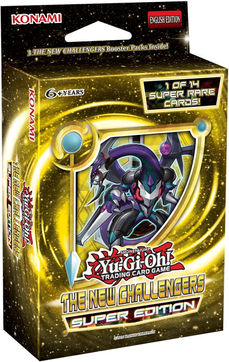 Podem ser encontradas no The New Challengers: Super Edition cartas para os archetypes "Number", "Des-Toy", "Furnimal", "Qliphoth", "Fusion", "Melodious", "Naturia", "Number", "Performapal", "Shaddoll", "Superheavy Samurai", "tellarknight", "Xyz","Yang Zing" e "Burning Abyss", além das séries "Herald", "Mystical Beast of the Forest", "Rescue" e "Solemn"
Item Reviewed: The New Challengers: Super Edition 9 out of 10 based on 10 ratings. 9 user reviews.